I used to think I liked Sushi and Sashimi. Then I thought I really liked it. Now that I've started dreaming about it and having it sometimes twice a day, I think addiciton is probably a more fitting term! Kevin (my room mate) and I just came back from a Sushi Bar in Northgate (shopping centre in the northern suburbs of Adelaide, as the name implies) for my fourth serve of the stuff in one and a half days. 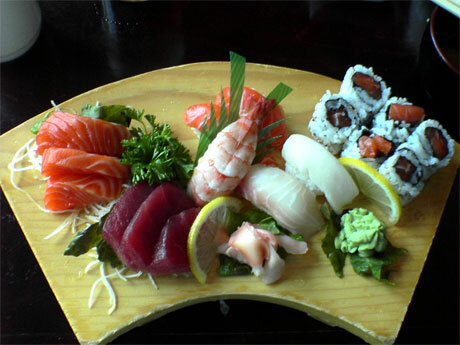 My favourites by far are the salmon sashimi and sushi with tuna. The sushi with avocado atop the seaweed is also tantalising, but can be a tad filling after you've had a few! I think I'm training myself to take a bit more heat too, the Rubenerd Wasabi/SoySauce Ratio is narrowing every time, though I make sure to only dab a minute amount on as not to smother the flavour of the sashimic goodness. The girls at the sushi bars here are very friendly and nice too, haha! Newer post ← Is WordPress.org Down?